“I appreciate everyone finds different things interesting, so don’t judge me for saying I read an interesting FCA report a couple of weeks ago! It was actually the follow up report to the recent survey undertaken with financial services firms, to determine how effective the FCA are, and what areas they could focus on improving. Fixed portfolio firms – those that “based on factors such as size, market presence and customer footprint, require the highest level of supervisory attention”. These firms have a specific supervisor contact at the FCA and regular, proactive supervision and continuous assessment. Flexible portfolio firms – everyone else, and therefore most of the people reading this. Clearly the firms that are used to FCA visits (Fixed portfolio firms), and receive them regularly, value them much more. They recognise that they are there to support, constructively challenge, and help achieve best practice. For Flexible portfolio firms, they will either have very little in the way of FCA visits, and not felt benefit from them, or just heard stories on the grapevine around them, thus being very unlikely to find them an effective process. Firstly ‘the Mission’, for those who aren’t aware (and the following chart suggests that is likely to be quite a few of you) is the FCAs mission they published last year. You can see how Flexible firms are much less aware of the Mission and, even those that do know about it are far less engaged with it. 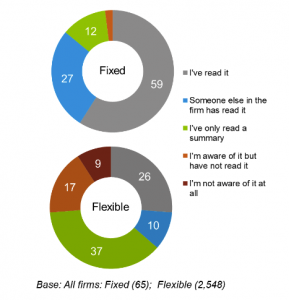 Just under half of Fixed firms (45%) felt the framework was relevant to their firms; whereas only 17% of Flexible firms felt the same. Flexible firms were also more likely to have experienced a decrease in their level of trust in the FCA in the last year, and a key issue for them was that they wanted to see the FCA take more decisive action against firms that are involved in wrong doing. The outcome of all of this to me? Firstly, the closer interaction the FCA has with Fixed firms appears to result in a higher level of trust in the regulator, and a better understanding of their purpose. 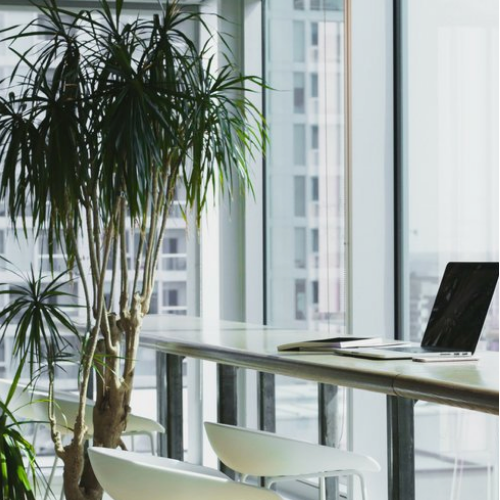 Clearly applying that level of supervision to all firms is impossible; but there are definitely areas that could be addressed to apply some of this additional support to Flexible firms, thus helping with their engagement. Secondly, it all reads positively to me; firms actually want to be closely involved with the FCA, they feel disengaged when they have little or sporadic contact, and they want wrongdoers to be dealt with swiftly, to protect the integrity of the profession. And this can only be a good thing. 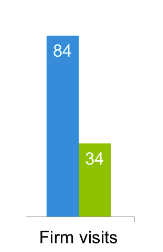 So – room for improvement, but with some glimmers of hope. I’ll be digesting the report further in the next week or so, might pop a cheeky post up on the website about it. Want more content like this? Sign up to Eclipse below!